Medium to large diameter pipes , ranging from 800 mm to more than 3000 mm can be cleaned by by abrasive that is propelled by blast centrifugal turbines with a production of more than 5 m2 per minute/per frame. 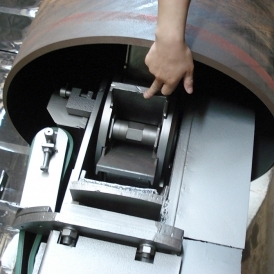 The machines are provided with accumulative cabinets, loading and unloading pipe system, tumble system and transfer and tumble movement system. The shot blasting machine has compact structure and stable operation. This is new type of special shot blasting machine designed and developed by PAXAA company with accumulating years of experience in small steel pipe spray cleaning machine manufacturing.